Screen Actors Guild Awards 2019: Black Panther wins top honour. 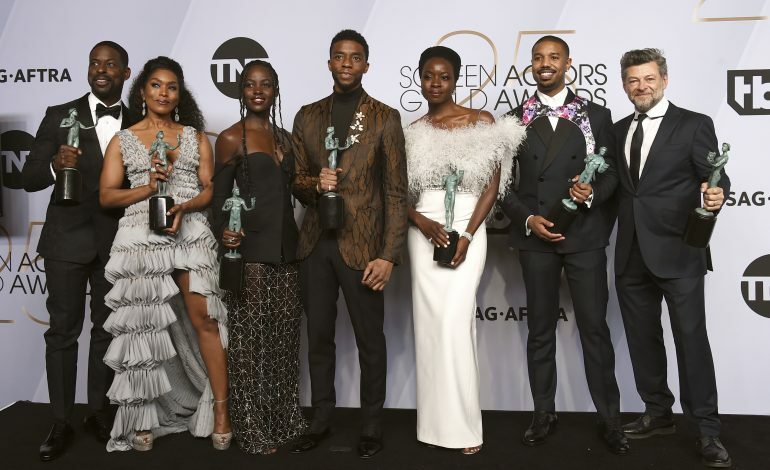 HomeBlack Panther Screen Actors Guild Awards 2019: Black Panther wins top honour. Black Panther took the top award at Sunday's 25th Screen Actors Guild Awards, giving Ryan Coogler's superhero sensation its most significant awards-season honour yet and potentially setting up Wakanda for a major role at next month's Academy Awards. The 2 leading Oscar nominees — Roma and The Favourite — were bypassed by the actors guild for the best ensemble field that also included BlacKkKlansman, Crazy Rich Asians, ‘Bohemian Rhapsody and A Star Is Born. But though Black Panther wasn’t nominated for any individual SAG Awards, it took home the final award at the Shrine Auditorium in Los Angeles. Before a stage-full of actors, Chadwick Boseman tried to put into context the moment for the trailblazing Black Panther, which also won for its stunt performer ensemble. “To be young, gifted and black,” he said, quoting the Nina Simone song. The win puts Black Panther squarely in contention for best picture at the Academy Awards. Actors make up the largest percentage of the academy, so their preferences can have an especially large impact on the Oscar race. In the last decade the SAG ensemble winner has gone on to win best picture at the Academy Awards half of the time.